Whither Russia in the Twenty-First Century? 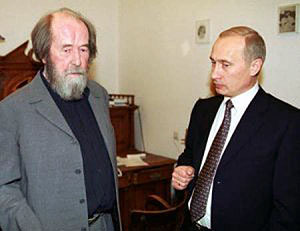 Aleksandr Solzhenitsyn (1918-2008) and Vladimir Putin (1952-) chatting in September 2000. Looks like they are having a lot of fun. Review all of the applicable chapters in the textbook since the midterm exam. Check the remarks by Professor Blois and Professor Evans on the future of Russia. Read the short excerpt from the satirical novel Monumental Propaganda by the Russian writer Vladimir Voinovich about the disappearance of the Soviet regime and Russia's prospects for the future. This short passage occurs near the end of the book. Read the special issue of the Economist from 2008 that covered key issues faced by Russia in the twenty-first century. (Log into Blackboard and look for the set of articles under "Course Documents."). This reading might help you prepare for the final exam essay question. Read my notes on Vladimir Putin. Enjoy this YouTube video, Complete History Of The Soviet Union, Arranged To The Melody Of Tetris. For 50 points maximum extra credit, dare to watch Russkii Kovcheg (Russian Ark, 2002)--Don't look at my comments on the film before you watch it-- and write a one-page paper explaining the film's presentation of Russian history. For extra credit, please suggest a relevant website for this unit of the course. Send the title of the site, the url and a brief explanation why you find the information interesting and applicable to the material being studied this Unit. Suggest an assignment for use somewhere in the course. Be creative! For extra credit of a maximum of 10 points, write a short paragraph in which you explain what you found most interesting about your study of Russian history in HIS 242 (or what you liked most about the course).